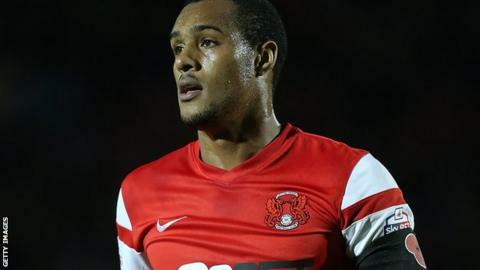 Jay Simpson scored a stoppage-time equaliser to give Leyton Orient a point away at Stevenage. Jay Simpson scored his 20th goal of the season to salvage a point for Leyton Orient at Stevenage. The visitors were awarded a penalty when Fraser Franks handled Simpson's shot and he stroked home the spot-kick. Stevenage drew level when Tom Pett's cross was headed in by Armand Gnaduillet from close range, and the Frenchman then ran onto Ben Kennedy's chip to put them 2-1 ahead. The O's rescued it right at the death when Simpson fired into the top corner. Leyton Orient move up to eighth in the table, two points off the play-off places, while Stevenage remain in 19th position. "We played some very good football to get ourselves back in the game. It was very disappointing to go behind to a penalty decision like that, but we played fantastically after that. "I wouldn't want to win a penalty that way. You cannot do anything about it when someone shoots from that close and it hits your hand. "I thought we played some fantastic football in some very difficult conditions. The desire to get back into the game was brilliant and we got our rewards and got back in the game and then in front." "It's poor defending. We work on it all week and we ask the players to go out and do a job and sadly they've got done it again so all that hard work Jay Simpson's doing at the moment is to no avail. "When they go across that line there's not a lot that we can do about it. "I shall be speaking with the owner and we'll be trying to do something to bring players in at the back." Match ends, Stevenage 2, Leyton Orient 2. Second Half ends, Stevenage 2, Leyton Orient 2. Corner, Leyton Orient. Conceded by Chris Day. Attempt saved. John Marquis (Leyton Orient) left footed shot from the centre of the box is saved in the bottom right corner. Attempt missed. Armand Gnanduillet (Stevenage) left footed shot from the left side of the six yard box is close, but misses to the left. Goal! Stevenage 2, Leyton Orient 2. Jay Simpson (Leyton Orient) left footed shot from the centre of the box to the top left corner. Assisted by Ollie Palmer. Substitution, Leyton Orient. John Marquis replaces Jobi McAnuff. Goal! Stevenage 2, Leyton Orient 1. Armand Gnanduillet (Stevenage) right footed shot from the centre of the box to the bottom left corner. Assisted by Ben Kennedy. Substitution, Leyton Orient. Calaum Jahraldo-Martin replaces Blair Turgott. Goal! Stevenage 1, Leyton Orient 1. Armand Gnanduillet (Stevenage) header from very close range to the centre of the goal. Assisted by Tom Pett. Attempt saved. Armand Gnanduillet (Stevenage) right footed shot from the centre of the box is saved in the bottom right corner. Corner, Stevenage. Conceded by Cole Kpekawa. Corner, Leyton Orient. Conceded by Jamie McCombe. Attempt missed. Jamie McCombe (Stevenage) right footed shot from the centre of the box is too high. Corner, Stevenage. Conceded by Frazer Shaw. Substitution, Stevenage. Ben Kennedy replaces Rohdell Gordon. Goal! Stevenage 0, Leyton Orient 1. Jay Simpson (Leyton Orient) converts the penalty with a right footed shot to the bottom right corner. Penalty conceded by Callum McFadzean (Stevenage) with a hand ball in the penalty area. Attempt missed. Michael Tonge (Stevenage) right footed shot from outside the box misses to the right. Michael Tonge (Stevenage) wins a free kick on the right wing. Attempt missed. Ronnie Henry (Stevenage) right footed shot from outside the box is just a bit too high. Hand ball by Ollie Palmer (Leyton Orient). Second Half begins Stevenage 0, Leyton Orient 0. First Half ends, Stevenage 0, Leyton Orient 0. Corner, Stevenage. Conceded by Jack Payne. Attempt missed. Jobi McAnuff (Leyton Orient) right footed shot from outside the box is high and wide to the right. Attempt missed. Jobi McAnuff (Leyton Orient) right footed shot from outside the box misses to the right.